Are you an Architect in an Engineers job? A manager in an Architects job? An Engineer in an Architects job. An Engineer in a Managers job? While others may decide or confer titles on you, we suggest you look into yourself, your soul, and decide first and foremost who the real you is, and then make any changes necessary, so that the real you shines through. Here we discuss a diagram from a book called “The Japanese Secret to a Long and Happy Life” by Francesc Miralles and Hector Garcia. Like most models, it is a powerful aid to thinking about yourself (and others) and can help you decide if you are in the right job, or if you are doing the right things for the right reasons. ¨ What you LOVE - This equates to what you like to do. What gets you out of bed in the morning. What you would choose to do if there were no other restrictions. ¨ What you are GOOD AT - This equates to what you are good at. There will be some things you are good at, and like doing, There will be other things you are good at, that you do not like doing. ¨ What OTHERS NEED - This was originally titled “What the world needs” but the word “world” puts a domain constraint on the question that need not be there. To one person “the world” may literally be the world. To others “the world” may mean their family, or the company they work for. As we have learned before “Context is King”™ and therefore you need to place the context you wish on the model to be able to answer its questions. ¨ What you can GET PAID FOR – This equates to getting something of value that you can exchange for other things you need, aka money. Since you are in control of the context, it allows you to utilise the model in different contexts. For example, one to represent your home life where “the world” is your family and “what you can get paid for” is the respect of your family (and the “payment” of your family achieving their Ikigai) and another to represent your working life where the company you work for is “the world” and the “payment” is your salary. Where these primary domains overlap is where happiness (and sadness) lies. At the intersection of what you are good at, and what you need lies your PROFESSION. At the intersection of what you are good at, and what you love, lies your PASSION. At the intersection of what others need, and what you need lies your VOCATION. And, at the intersection of what others need, and what you love, lies your MISSION. The other intersections illustrate areas of partial Ikigai where three of the four aspects are fulfilled but one is not. ¨ Satisfying what you love, what you are good at, and what you need, leaves a feeling of USELESSNESS, because you are not doing what OTHERS NEED. ¨ Satisfying what others need, what you love, and what you are good at, means you have NO WEALTH, because you are not doing what you can GET PAID FOR. ¨ Satisfying what you need, what others need, and what you love, leaves you with a sense of UNCERTAINTY, because you are not doing what you are GOOD AT. ¨ And, satisfying what you are good at, what you need, and what others need, leaves you with a feeling of EMPTINESS, because you are not doing what you LOVE. Ikigai, is that perfect balance where you balance what you need, with what others need, with what you are good at, with what you love. ¨ I am doing what I truly love to do (maturing the Transformation domain of Enterprises). ¨ I (believe) I am good at it. So, I feel delight and fulfilment, but have no wealth. For me this is fine, because I place a much higher value on doing things I enjoy, that I am good at, and that help others, than any monetary gain. Money is not what gets me out of bed in the morning. The other three together do. What do you love and what are you good at? Are they the same things? If not, what are you going to do about that? 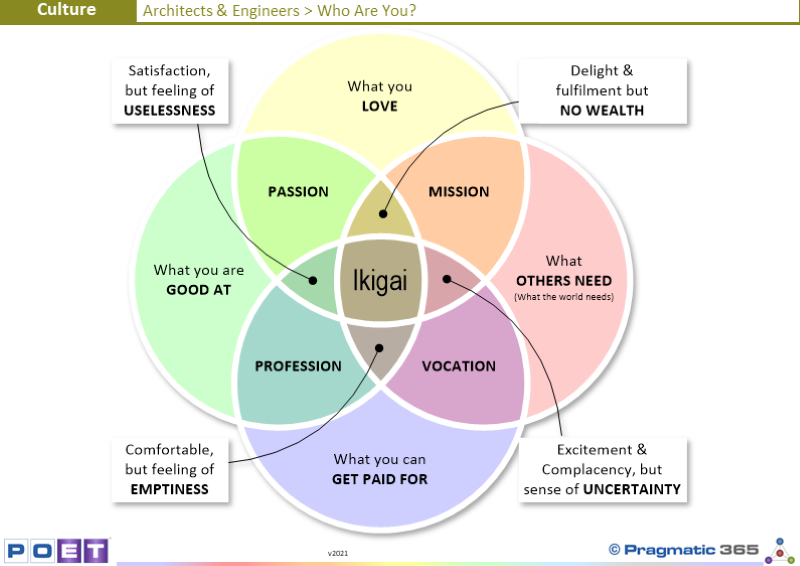 How does your home Ikigai map, compare to you professional Ikigai map? If you were only able to satisfy 3 out of the 4 primary areas, which ones would you chose? Why?